Soak the beans in cold water overnight. Rinse off the beans, then put them in a big pot since the beans will expand a little more during cooking. Add water till it is 1 inch above the beans. Bring the water to a boil, boil for a minute then drain the beans. Put the beans back in the pot and add water till it is 1 inch above the beans. Bring to a boil, then turn heat to medium low. Let simmer for at least one hour, adding water if it needs it. 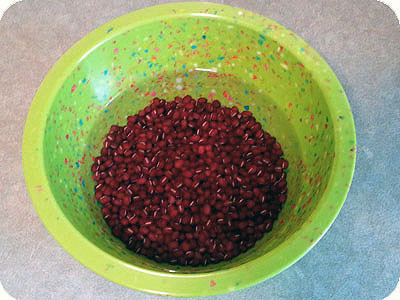 Drain the beans, reserving the cooking liquid in a separate bowl. Put the pot of beans back on low heat. Slowly add the sugar and salt while stirring to distribute the sugar and salt evenly. If it looks too dry, you can add a little of the reserved cooking liquid in. Continue cooking for 10 minutes until the sugar is completely melted. To turn it into crushed bean paste on the top right, you just need to mash it up in the pot with your spatula, as if you were mashing potatoes. You can add more of the cooking liquid if it needs it. To turn it into strained bean paste on the bottom, put the beans into a food processor or blender and process until smooth. Add more cooking liquid as needed. Japanese sweets: foreign, mysterious, but oh so delicious! Okashi can be intimidating because of the difference in texture. Rice is their traditional grain, so a lot of their sweets have rice flour instead of wheat. Rice flour has a chewier texture, so when you first bite into it, you might be surprised. Think of it as a super dense marshmallow. It’s strange, but it’s still sweet, so why not give it a try? Another difference in these desserts is their choice in flavors. Of course, chocolate, vanilla, and strawberry are a classic, but they have more unique flavors as well. One of my favorite flavors is red bean paste. A lot of Japanese sweets are based on beans that are cooked with a ton of sugar so they are super sweet, and you probably wouldn’t even realize you were eating beans unless someone told you. 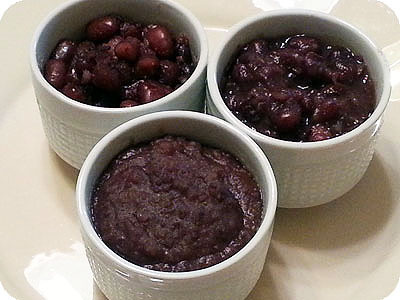 Azuki beans are the most popular kind of beans to use, and azuki bean paste is called anko. ( 餡子, あんこ) When I first tasted it, I thought it was weird, but I had to remember, the Japanese aren’t the only ones to use vegetables in their desserts. (ever had carrot cake?) After tasting it a couple of times, ankostarted to grow on me, and now I even find myself passing up chocolate for it! koshi-an (漉し餡, こしあん, strained bean paste) – a smooth paste made only from the inside parts of the bean. 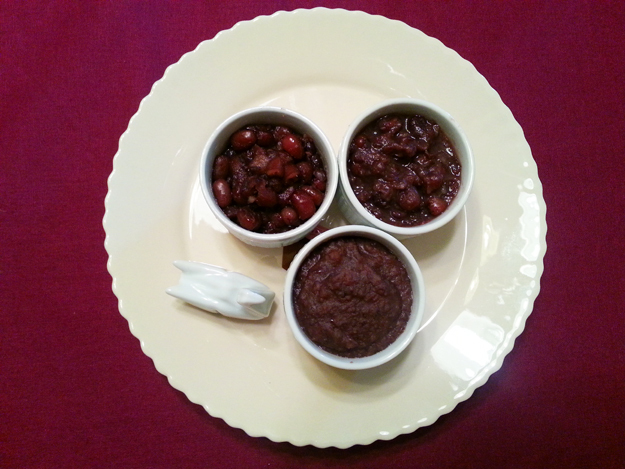 tsubu-an(粒餡, つぶあん, whole bean paste) – a hearty paste where the beans are left whole. tsubushi-an(潰し餡, つぶしあん, crushed bean paste) – a hearty paste where the beans are partially mashed. Which one you like the best is up to you, this recipe can be adapted to make any version of them. You might also want to add or reduce the amount of sugar in the recipe, depending on how sweet you like your treats! 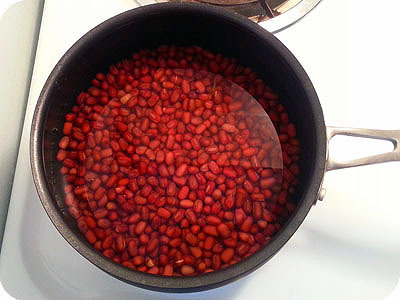 – Soak the beans in cold water overnight. Soaking beans allows them to absorb the moisture to cook evenly and keep the beans from splitting, which is especially critical if you want to make whole bean paste. – You’ll notice after they’ve been soaking that they will grow in volume. They’ve now absorbed the water evenly and are ready to be cooked. 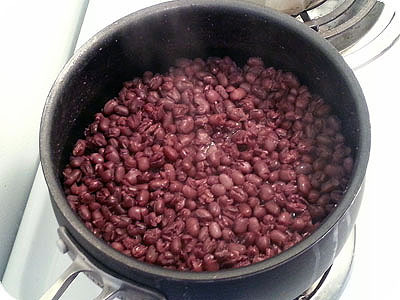 – Rinse off the beans, then put them in a big pot since the beans will expand a little more during cooking. Add water till it is 1 inch above the beans. Bring the water to a boil, boil for a minute then drain the beans. Doing this helps remove surface impurities from the beans. – Put the beans back in the pot and add water till it is 1 inch above the beans. Bring to a boil, then turn heat to medium low. Let simmer for at least one hour, adding water if it needs it. You will know if the beans are done by the texture of the beans. If they are easily falling apart or mushy, they’re ready. 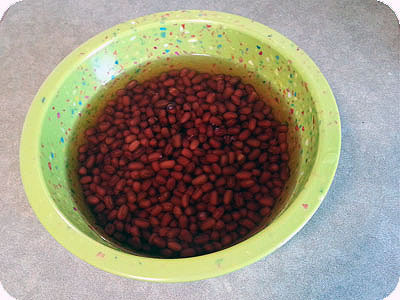 Drain the beans, reserving the cooking liquid in a separate bowl. – Put the pot of beans back on low heat. Slowly add the sugar and salt while stirring to distribute the sugar and salt evenly. If it looks too dry, you can add a little of the reserved cooking liquid in. Continue cooking for 10 minutes until the sugar is completely melted. Thanks for great, simple recipe and explaination. I have taiyaki pan given to me as a gift, and I want to fill them with home-made fresh anko! YAY! My favorite are the custard filled ones, but anko is a close second!